“Long ago, in a peaceful forest…” the animals gathered around a kindly old hermit to hear a story. The tale was about a hunter who had lived in their forest; he hunted just for fun and the animals lived in fear. Fortunately, the holy sage Narada came there. He showed the hunter how by hurting animals we hurt ourselves—and the joys of being their friend. Through Narada’s love and kindness, the hunter became a new person. 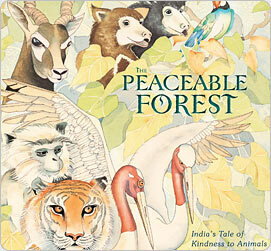 This ancient tale from India inspires compassion and respect for all life. Beautifully illustrated in full color by Anna Johansson, it ends with a surprise. — John Robbins, author The Food Revolution, Diet For A New America, No Happy Cows, and many other best-sellers.